Man Lights Fireworks. 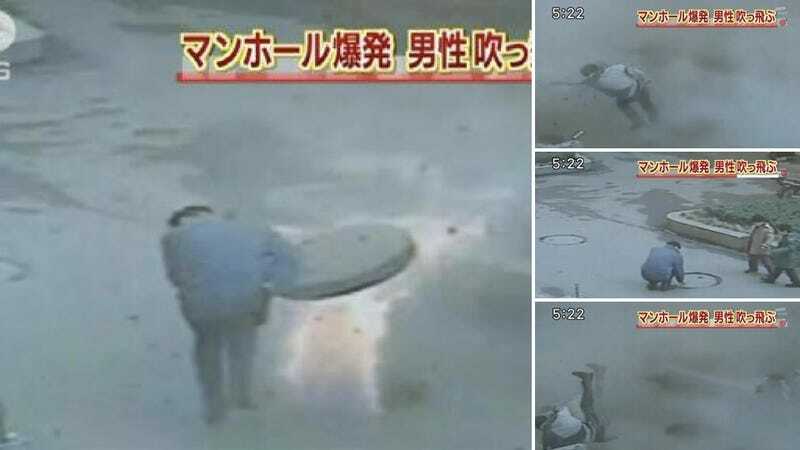 Man Blows Up Manhole. A man in a blue jacket crouched, lighting a firecracker on a manhole. The children stuck their fingers in their ears. What happened next was caught on a security camera. It can only be described as unbelievable. Gas in the drainage system unexpectedly caught fire, causing an explosion that sent the 44-pound manhole several stories into the air, before hitting the side of a building. The man's jacket, not his arm, was blown clean off, and he was lifted up, landing over six feet away from the blast. His arm is visible as he falls out of frame. The incident occurred on Jan. 29 in China's Hunan Province. This clip was broadcasted on Japan's TV Asahi evening news. According to TV Asahi, the man suffered burns to his face, but thankfully, neither of the children was injured. This is like watching Nintendo's Manhole Game & Watch gone very, very wrong. Glad to hear the kids are okay and hopefully the father will make a full and speedy recovery.